I invite you to cultivate a daily Spiritual Practice, to invite in the Sacred, sit in silence and listen. To connect with your wonderful, wise, brave and loving inner Goddess. Seek your own inner wisdom and guidance, especially when you are lost, fearful, confused and in need of answers and clarity. As you embrace your inner Goddess, you will feel a soul shift, you will see the world through different eyes, you will find the answers you seek, become bold and dream big. And that's where the magick happens...you will create the life you desire, inspire others and most of all Sparkle...shining your light bright. Spending 10 minutes a day in our Sacred Space, especially upon awakening, connecting to our Higher-self, can make a huge difference in how we move throughout the rest of the day. Allowing us to live life from a place of Grace and Ease...no matter what the day may bring. and Moonlit Pearls of Inspiration! Creating and Maintaining Sacred ﻿Space is a﻿ self-paced 6-﻿week eCourse ﻿inviting you to explore some creative and useful ways to infuse your personal space with your own essence, creating a magickal Sacred Space for journaling, meditation, prayer, arting, doing yoga or any other creative outlet that makes you Sparkle! If you have been wondering how to create and maintain a Sacred Space of your own and you are open to exploring what Sacred Space means to you though your own Creative Lens - then this eCourse is for you. Explore what Sacred Space means to you. Learn ways to clear and cleans you Sacred Space. Discover ways to invite Sacred Space throughout your home. Tap into your own wisdom and awaken your inner knowing. A journal, notebook something to keep the answers to the journaling questions and Artsignments™ along with your thoughts and feelings in one place. An open mind and heart to explore not only the offerings in this course but also your inner knowing. A playful attitude, have fun, get creative, enjoy the process. 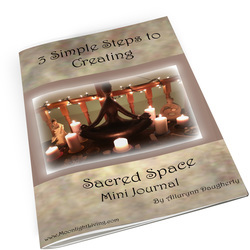 "Allurynn’s Creating and Maintaining Sacred Space eCourse is the most comprehensive and fun way to design a space to welcome your connection with your divine guidance, create peace in your home and enhance your happiness. She takes you on a step by step journey using beautiful photos, resources and exercises in each lesson that will help you create your custom designed, spiritually healthy Sacred Space. The technique and tools Allurynn shares will leave you feeling like she has personally entered into your home and helped you create your Sacred Space. Having a Sacred Space is the foundation of any spiritual practice. Allurynn’s eCourse will guide you on a journey to a deeper connection with your inner guidance and divine wisdom. I highly recommend this eCourse."